Ask just about any blogger out there, if you want to drive insane amounts of traffic to your blog you need to use Pinterest to do it. More often than not Pinterest is responsible for a large percentage of blog traffic no matter what the niche. If you are new to Pinterest you can read what it’s all about here. Most bloggers that use Pinterest to its fullest potential do so with the use of schedulers such as Tailwind or Boardbooster. These are both services that approach Pinterest from different aspects. Each has their own strong point and for that reason, quite a few bloggers actually use both. The catch is there is a monthly fee for each. I don’t know about you, but I am finding that blogging is the most expensive job I have ever had. Sometimes it can be frustrating. How can we make a profit if we are continually spending money on education, email service, tech support and now schedulers? So, what if I told you there is another way to approach Pinterest successfully without using either of these services? What if I also told you this new approach will actually help to increase your page views each month? 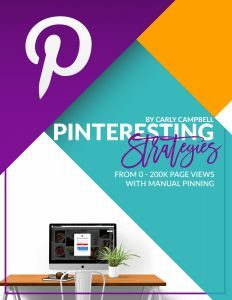 My good friend Carly from mommyonpurpose.com has a book that will change the way you look at Pinterest. She teaches how to strategically pin your pins manually to get the best results. Yep, no schedulers needed for this nifty trick! I have been using her techniques for months and my page views are quite amazing. I love that I am able to pin in a way that drives traffic at peak times specific to my site. I am not at the mercy of mechanical schedulers hoping they hit at the right time. I am able to pick the when and the where depending on the day and the month. Because as you and I both know there are busy days and slow days. There are busy months and there are painfully depressingly slow months. Being able to manually pin strategically is a game changer that you simply need to try! 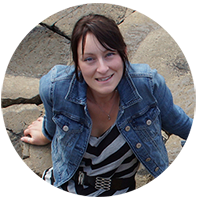 I thought it would be great to chat with Carly and really understand how she came up with this awesome sauce book and how it has helped her blog soar to new heights. Hi, Carly, I am so excited you are here! Your blog is really growing fast! How did you first come up with the idea of Pinteresting Strategies? Hi, Tracy Lynn, I’m excited to be here and to talk Pinterest because it’s my favorite topic! (Even if it is one of the most frustrating things we deal with as bloggers.) I first came up with the idea to write the book when I realized I was pinning differently than almost everyone I talked to. They were all complaining that their Pinterest traffic was tanking, and mine was growing! How do you feel about schedulers and why do you choose not to use them? I hate schedulers! I mean, I wish I could love them because there are just not enough hours in the day – and obviously, schedulers are supposed to free up some of our time… but I believe schedulers are one of the main reasons that we see these aggravating algorithm changes so often. Platforms need to adjust to be able to stay relevant when they are being spammed constantly by scheduled content. I choose not to use a scheduler because I see FAR better traffic to my blog when I pin manually. Plus – it’s FREE! How has manually pinning brought success to your blog? Manual pinning has grown my blog’s traffic to over 250k pageviews / month (on average) and allowed me to replace my desk job income with ad income alone. When I start to get sick of manual pinning, I just remind myself of that! How do you handle Pinterest algorithm changes? I cry and drink (can we say that?!). When Pinterest changes something I try not to get too frustrated. I keep diligently pinning and try new things to “shake up” my Pinterest strategy, like leaving group boards, or adding new keywords for pins, or pinning more or even LESS. As long as you are IN Pinterest (not scheduling it) you should be able to see what changes are being made and stay on top of them. Well, since the goal of my current book is to teach people to GET traffic, I’d like to help them MONETIZE that traffic next! I have a workbook (which I am still technically “working on”) that teaches people how to make money blogging before they have a dedicated email list. I have high hopes that it’ll be a useful tool for new bloggers in all niches! If you are interested in learning more about Carly’s book you can jump over here to check it out. I love to blog! I can’t say that enough. Sure it’s time-consuming (who needs sleep? ), there is a TON of things to learn, your best friends live miles and miles away, (thank goodness for skype and blogging conventions!) and in the beginning, it can be hard to make money. Once you do, once you figure out the secret ingredient that will take your blog from average to amazing then blogging will be the best thing that ever happened! Where else can you make a living from home, in your pajamas (is that just me?) playing on your laptop with people all over the world?! Do your research. Try new things. Arm yourself with the best tips and tricks you can get your hands on. And watch things take off! Carly Campbell is a sleep deprived full-time mommy and blogger at mommyonpurpose.com. She is a Pinterest nut and loves to shout her unpopular Pinterest opinions from the rooftops. Really enjoyed knowing more about Carly experiences. Ever since I read her book, I can’t get back to scheduling though I have annual package for one and a monthly for the other. Carly’s strategies and insight into Pinterest algo are so logical, being ‘off’ Pinterest and still expecting equal favor, like the one for LIVE pinners, will NEVER make sense to me again. I wouldn’t favor both people the same if I were Pinterest! 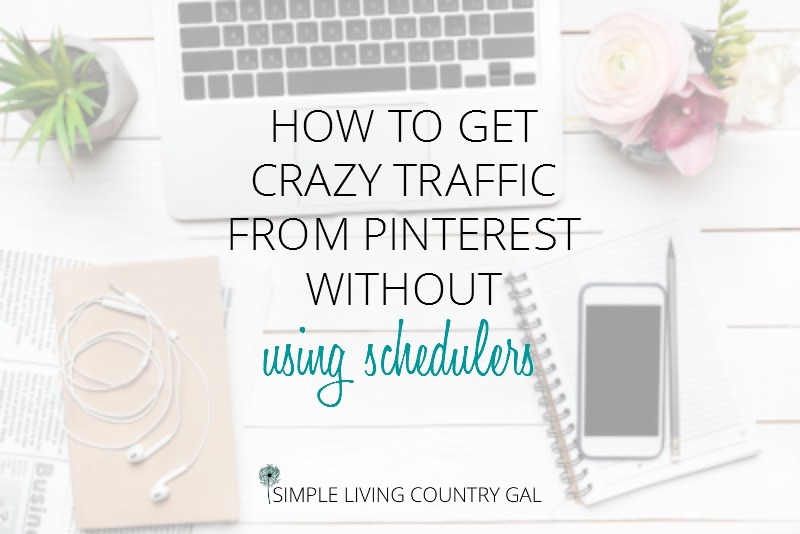 Even when I first learned about schedulers as a new blogger, I felt so lonely realising if everyone is scheduling, then who else is here on Pinterest with me? The same pins I was scheduling are getting more repins (Pinterest is showing them more) and my followers (even if they are said not to matter as much) are increasing a GREAT deal faster. I can swear this wasn’t happening with scheduling. So thank you so much girls. I couldn’t agree with you more! I felt the same way….was I the only one on Pinterest if everyone out there was using a scheduler? I am so happy more and more people are live pinning I think it makes Pinterest a more authentic place. I would also think that Pinterest would give a little more “juice” to those of us that are live pinning!